Film 'A Paying Ghost' to Rock Scenes! Home News Film ‘A Paying Ghost’ to Rock Scenes! Film ‘A Paying Ghost’ to Rock Scenes! A film with a story of ghosts is all set to release on 29 May! The film is called as ‘A PAYING GHOST‘! And in the film ghosts will entertain everyone and their human traits will tease people but they won’t terrorize people. Nowadays films with different subjects and content are being made and the audience is lapping it up. Such a different film is ‘A PAYING GHOST’which will mesmerize you from 29 May. 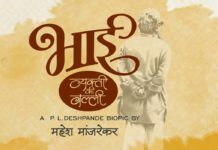 The film produced by Lade Brothers Pvt Ltd and Ambairsh Darak is eagerly awaited by the audiences . The star pair of Umesh Kamat and Spruha Joshi sizzle in the film. The co-producers are Rohan Shinde Naik and Babasaheb Yelpale . The music launch and the first look of the film was held in a grand scale recently at the hands of Sachin Pilgaonkar. The film is based on a story by VP Kale and his daughter Swati Chandorkar wished the team of the film including director Sushrut Bhagwat. The film’s cast includes Pushkar Shrotri, Shravani Pillay, Sanvi Naik, Samruddhi Salvi, Mrunal Jadhav, Sameer Chougule, Atul Parchure, Khushboo Kulkarni, Srirang Deshmukh, Siddhi Kolekar Siddheshwar Jhadbuke, and Mahesh Manjrekar. The film has music by Narendra Bhide and lyrics by Vaibhav Josi and choreography by Deepali Vichare,and Subhash Nakawe. SushrutBhagwat hasadapted the story along with Shravani and the dialogues are by Sanjay Mone . DOP is Prasad Bhende. Director Sushrut Bhagwat says, ” I and my friend Shravani Pillay adapted this VP Kale popular story ‘Badli’ and we were on the lookout for a producer toproduce this family entertainment film and luckily when we narrated the story to Jayant Lade, he liked itand immediately agred to produce the film and we were very happy. For a debutant director like me, Lade showed confidence in me and I will always be indebted to him and I must thank my entire team too”. Producer Jayant Lade says, ” I was always creatively inclined and was alwaysthinking of making films and made a few TV shows and gained experience and when I came across this story by Shushrut Bhagwat and Shravani Pillay and decided to produce this film which was a tough decision but ultimately thefilm is complete and will release on 29 Th May and the audiences will like the humane sensitive story and the funny ghosts in the film”. Next articleSurabhi Hande : Mhalsadevi from Jai Malhar to Debut in Films!